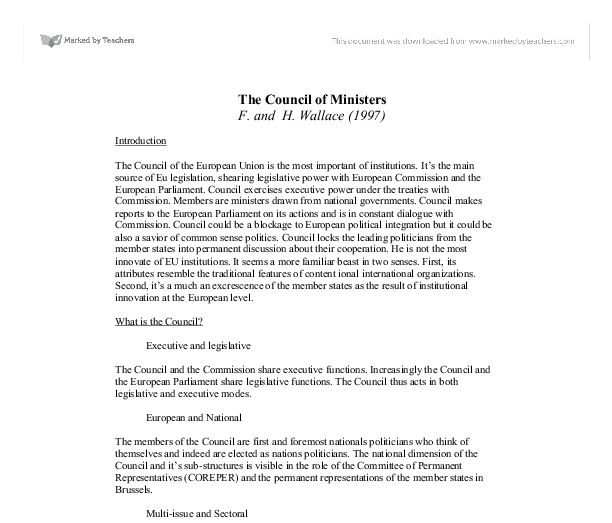 The Council of Ministers F. and H. Wallace (1997) Introduction The Council of the European Union is the most important of institutions. It's the main source of Eu legislation, shearing legislative power with European Commission and the European Parliament. Council exercises executive power under the treaties with Commission. Members are ministers drawn from national governments. Council makes reports to the European Parliament on its actions and is in constant dialogue with Commission. Council could be a blockage to European political integration but it could be also a savior of common sense politics. Council locks the leading politicians from the member states into permanent discussion about their cooperation. He is not the most innovate of EU institutions. It seems a more familiar beast in two senses. First, its attributes resemble the traditional features of content ional international organizations. Second, it's a much an excrescence of the member states as the result of institutional innovation at the European level. What is the Council? Executive and legislative The Council and the Commission share executive functions. Increasingly the Council and the European Parliament share legislative functions. 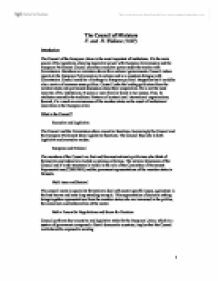 The Council thus acts in both legislative and executive modes. European and National The members of the Council are first and foremost nationals politicians who think of themselves and indeed are elected as nations politicians. The national dimension of the Council and it's sub-structures is visible in the role of the Committee of Permanent Representatives (COREPER) and the permanent representations of the member states in Brussels. Multi-issue and Sectoral The council meets in specialist formation to deal with sector specific issues, agriculture is the best known and most long-standing example. ...read more. Legislation 1. Much EU legislation is adopted jointly by the Council and Parliament As a rule, the Council only acts on a proposal from the Commission, and the Commission normally has responsibility for ensuring that EU legislation, once adopted, is correctly applied. 2. Co-ordinating the economic policies of member states The EU countries have decided that they want an overall economic policy based on close co-ordination between their national economic policies. This co-ordination is carried out by the economics and finance ministers, who collectively form the Economic and Financial Affairs ("ECOFIN") Council. 3. Concluding international agreements Each year the Council "concludes" (i.e. officially signs) a number of agreements between the European Union and non-EU countries, as well as with international organizations. These agreements may cover broad areas such as trade, co-operation and development or they may deal with specific subjects such as textiles, fisheries, science and technology, transport etc. In addition, the Council may conclude conventions between the EU member states in fields such as taxation, company law or consular protection. Conventions can also deal with co-operation in the field of Justice and Home Affairs (see the section on Justice and Home Affairs). Approving the EU budget The EU's annual budget is decided jointly by the Council and the European Parliament. If the two institutions do not agree, the rules allow the Council to take the final decision on "compulsory expenditure" (mainly agricultural expenditure, and expenses arising from international agreements with non-EU countries), while Parliament has the last word on "non-compulsory" expenditure and the final approval of the budget as a whole. ...read more. This means that, for a proposal to be adopted, it needs the support of a specified minimum number of votes. (The details are given below). However, in some particularly sensitive areas such as CFSP, taxation, asylum and immigration policy, Council decisions have to be unanimous. In other words, each member state has the power of veto in these areas. Unanimous agreement is already hard to achieve between 15 countries: in an enlarged Union of 27 or more it will be virtually impossible. If it kept trying to operate under its present rules, the EU would be paralysed - unable to act in many important fields. So the Treaty of Nice changes the rules, allowing the Council to take decisions by qualified majority voting in quite a number of areas that used to require unanimity. Until 1 May 2004, the minimum number of votes required to reach a qualified majority is 62 out of the total of 87 (i.e. 71.3%). For a six month period from 1 May 2004, when new member states join the EU, transitional arrangements apply. From 1 November 2004, a qualified majority will be reached * if a majority of member states (in some cases a two-thirds majority) approve AND * if a minimum of votes is cast in favour - which is 72.3% of the total (roughly the same share as under the previous system). In addition, a member state may ask for confirmation that the votes in favour represent at least 62% of the total population of the Union. If this is found not to be the case, the decision will not be adopted. 1 ...read more. The Treaty of Amsterdam is to promote equal opportunity, free movement and economic growth. This treaty allows workers and businesses rights at the work place. The workers have the right to be treated fairly and confidentially. This in return improves employer and worker relations and improves employee performance. Whether Sweden, with or without the euro, can expect to exert much influence in the Union seems doubtful, but fears about investment might prove well-founded. Sweden competes successfully in the market for global capital. Measured by trade and by flows of investment, it is one of the most open economies in the world. percent below the cost of production, similarly, The European Union also exports key commodities for less than the cost of production. In other OECD countries, agricultural subsidies rose from US$271.2 billion in 1986-88 to US$330.6 billion in 1998-2000 (Clapp, 2006:565). The members of these Courts, which sit in Luxembourg, are appointed for six years by agreement between the governments of the Member States. Their independence is guaranteed The Court's role is to ensure that the European Treaties are interpreted and applied in accordance with the law. The world would be further away from global investment rules than ever, and this for a long time, if we in the OECD cannot agree on the first cornerstone'. Fortunately the Commission lacked the authority to make such decisions and I hope that this status quo will remain. the constituency by giving solutions to problems that can only be achieved through collectively binding decisions. Furthermore, there exist several mechanisms with which legitimacy in the Union can be sustained. For instance, Majone argues that pareto-improving policies should be left the regulatory agencies in Europe, and only redistributive policies would need democratic legitimation. One's communicative success includes speaking, reading, listening and reasoning skills. * Channel: This is medium through which the information travels. There are two ways by which the information can be sent and they are the formal and the informal channel. Presidents and Prime Ministers of member states meet every 4 years, this form is known as the European Council. These meetings resolve any issues that couldn't be done by ministers at normal council and parliamentary meetings. These meetings often generate a great deal of media attention and are often held right through to the early hours of the next morning.